Milan, also named Molang or Miruan, is located at 70 km northeast of Ruoqiang downtown. The Milan site lies to the east of Milan Township, which was reported firstly in 1876 by the explorer Nikolai Przhevalsky. In 1906-1907 Aurel Stein has conducted two excavations to the site and robbed a large number of precious artifacts, including the famous fresco with one winged angel. 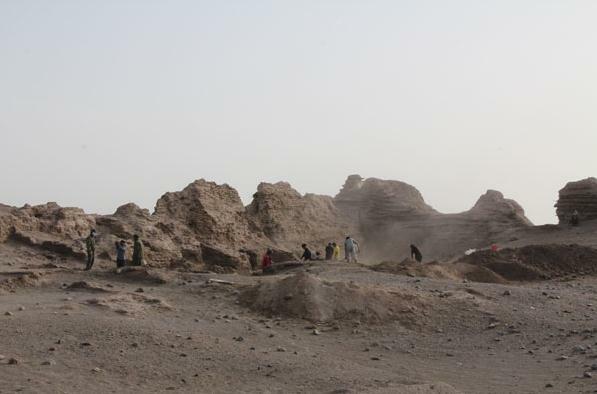 Since 1970s Xinjiang Institute of Cultural Relics and Archaeology has undertaken several excavations to the site, but the results are still not published. In 2012, incorporated with the reinforcing and salvaging project of the Milan site, an excavation has been carried out by personnel from Xinjiang Institute of Cultural Relics and Archaeology. Totally an area of 2,000 square meters has been uncovered, yielding over 300 various artifacts. The site is composed of 15 individual remains, including 1 fort, 8 pagodas, 3 Buddhist temples, 2 beacon fires and 2 other remains. Among them the currently best-preserved units are Fort MI, Temple MII, Pagoda MIII, Temple MIV, Pagoda MVI, Pagoda VII and a beacon at the north. All other remains left only partials of wall or foundation. This excavation emphasizes parts of Fort MI and Pagoda MIII. Fort MI is located in the east of the site. It has a nearly rectangular shape with the east, south, west and north walls respectively 92 m, 84 m, 50 m and 77 m long (the outer sides). At the four corners there are watchtowers. At the middle points of the north and east walls there are mamians Bastion built with mud bricks. At the south there is an earthen platform with 13 m high which is encircled with three breastworks at the east, south and west sides. They are built with rammed earth or mud bricks mixed with rose willow branches. On the top of the breastworks there are crenellations. On the east and west walls there are also breastworks with the same structure. According to previous excavations buildings distribute in the north, east and south parts. The middle and west areas are broad and empty. Buildings in the east have larger sizes. This excavation focuses on the north buildings. Besides, the east and west parts out of the fort and the south and west parts within the fort have also been unearthed in small scale. The excavation reveals that the fort was built on the base of an early ruin and its walls have been repaired for several times. The earliest walls are built with rammed earth with each rammed unit in a square shape each side measuring 1 m long. The existing east, south and west walls are covered with mud bricks on the outer surfaces, and the north wall is covered with mud bricks on both inner and outer surfaces. These mud brick structures are obviously a later remain. Outside the east wall there is a retaining slope made of mud bricks on the base of early ruins. The west wall has two gaps at the north section which could be locations of gates. Foundations made of rammed earth could be seen on the ground. The buildings in the north of the fort are all in irregular shapes except those built along the north wall. They are paved with single layer of mud bricks. The largest one measures ca. 6 m long and 4 m wide, and the smallest, 1.5 m long and 1.5 m wide. All are semi-subterranean structures in rectangular or square shapes. Those houses built along the north wall usually dug niches or small storehouses into the wall. They overlapped with each other. Some houses are sealed after abandoned. In the filling earth within the houses there are lots of wooden slips, leather armors, textiles and some ceramics and bronze objects. House remains are also found to the east and west outside the fort and in the south within the fort. Their structures and building methods are as the same as those found in the north of the fort. They are built on the base of earlier ruins. Temple MIII: There exists a foundation on the ground in square shape with each side measuring 9 m long and 2.85 m high, tapering from the base to the top. In the central of the foundation there is a round stupa with 2.5 m high and 3 m in diameter. At its east, north and west remains massive collapsed clay. When the stupa is built, firstly a square foundation pit with each side 11 m long and 2 m deep is dug, and the four walls of the pit are coated with white ash with 0.5-1 cm thick, then square mud bricks with 40 cm long are used to build four walls from outside to inside each measuring 1 m in thickness. The west wall is thickest, ca. 1.5 m. the inner surface of the west wall is covered with a layer of mud mixed with grass. The foundation of the pagoda located at the central of the pit is in square shape, built in the same way with square mud bricks of 40 cm long. Its four corners each has an L-shaped wall connecting with the four surrounding walls, therefore divides the foundation area into four rectangular shaped pits. On the upper part of foundation bulit the outer wall of the pagoda which tapers from the base to the top. At the center there is a round stupa with the gate toward west. Between the outer wall and the stupa is the inner corridor, which surface of outer wall is painted with murals. The most famous motif is the winged angel. From ruins at the east, north and west of the pagoda a great deal of silk flowers, fresco fragments and inscribed Sanskrit wooden slips are found. The excavation yields totally 300 objects, all from house ruin of MI and ruin of MII. Fort MI yields 289 artifacts including 90 wooden slips, 103 various wooden objects, 5 bamboo ware, 1 gourd, 8 bone and horn objects, 35 leather, woolen and flax objects, 28 ceramics, 7 bronzes, 9 stone ornaments, 2 irons and 1 package of cinnabar. Pagoda MIII yields 26 objects including 8 wooden objects, 1 wooden slips, 5 pieces of fresco and 12 various textiles. 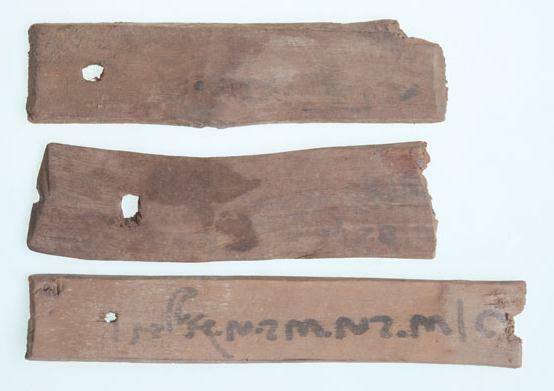 Combined with the previous finds, the Buddhist remains in the Milan site could be dated back to the 3rd-4th century AD. The latest date of the fort could be the 8th-9th century AD, but the earliest date remain unclear.